It turns out that, despite the rhetoric of nativist politicians, undocumented Mexicans aren’t the only ones responsible for violent crimes in Arizona. Rep. Raul Grijalva had to close his Yuma office due to a bullet that came ricocheting through his window yesterday. As a weakened SB 1070 goes into effect today, rubber bullets and pepper spray along with handcuffs greeted protesters rebelling against a law that they consider unjust and inhumane. 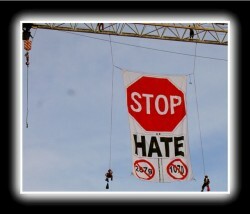 A “Stop Hate” banner was hung over a Phoenix crane last night, indicating that immigrant rights advocates are still not happy with SB 1070 going into effect or 287(g) laws that allow local law enforcement to act like immigration officials. Partial justice is still injustice. Portions of SB 1070 still target undocumented day laborers. The law that went into effect today allows for the impounding of vehicles belonging to undocumented workers or vehicles used to transport people who are undocumented. Employer sanctions for hiring undocumented workers is still in effect. Harboring and trafficking — as in transporting — undocumented immigrants is still a crime. Sanctuary cities remain illegal in Arizona. In a show of civil disobedience, several hundred protesters blockaded a Phoenix jail today and gathered at the downtown headquarters of the infamous Maricopa County Sheriff Joe Arpaio, who had earlier pledged to conduct a “crime sweep” looking for more undocumented immigrants. However, Sheriff Joe was deterred from his plans because he had to divert resources to protesters blockading the 4th avenue jail. “I got a gut feeling we will not be arresting any illegal aliens with all this hype going on,” he said to the AZ Central. I also doubt Sheriff Joe would arrest many undocumented immigrants through his infamous crime sweeps with or without the hype. The raids are just a way of getting attention and media spotlight, which Sheriff Joe Arpaio thrives on. In the meantime, the state of Arizona has filed an appeal to the Ninth Circuit asking the court to lift a federal judge’s order blocking parts of new immigration law. They can’t wait to get this to the United States Supreme Court fast enough. The protests continue, not just in Arizona, but in major cities across the United States.